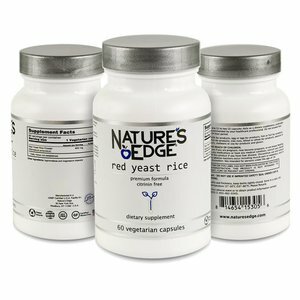 Red yeast rice is the only fermented whole food (dietary supplement) that has the same all-natural compound that is in the statin Mevacor (Lovastatin) for maintaining healthy cholesterol in the blood. Red yeast rice has lower amounts of this compound than what Mevacor (Lovastatin) has, but studies has shown that it still showed positive results in research studies. Mother Nature’s tonic for cholesterol, concentrated red yeast rice is used for alternative health care and along with a proper diet to help maintain a healthy cholesterol level. Many statins give side effects, but there are no side effects of muscle aches, headaches or nausea that have been reported to Nature’s Edge. Tested in our FDA-approved lab to confirm purity, safety and dosage amount. All natural, Citrinin free and GMO free. Unconditional 90 day money back guarantee. …and then compare it with what you are taking now. As an alternative health care provider, whenever health care traditional (drug pushing) professionals recommend ingredients in our products, we break out the champagne. So when they actually give praises to a product that helps you move around easier and longer all day long, it’s time to pop the cork! Of course it helps that red yeast rice and statin drugs has the same compound that can help reduce the liver's production of cholesterol in many people. It hinders an enzyme called HMG CoA Reductase that the liver uses to make cholesterol. Many research studies on red yeast rice was for four to eight weeks. We recommend giving it that time range, also. It takes time for it to properly build up in the body. Take one easy-to-swallow capsule a day for 600 milligrams or 1,200 milligrams a day for extra strength for more serious symptoms.